TAC POLARIZED LENS - TAC lens includes 9 layers. 100% UV400 protection coating, blocks 100% harmful UVA & UVB Rays and protect eyes perfectly. Polarized sunglasses reduce glare reflected off of roads, bodies of water, snow, and other horizontal surfaces. HIGH QUALITY FRAME - Made with metallic alloy that is ultra light weight yet strong and durable. Lightweight and strong rectangular vintage polarized mens sunglasses. SILICONE NOSE PADS -- Which can adapt to different nose shape, reduce the burden on the bridge of the nose. Environmental and skin-friendly materials. Elastic and weight-free features enables you a long-time wearing without fatigue. AL-MG ARM & SPRING HINGE-- Light-weighted Al-Mg arm gives you stress-free wearing experience and is skin-friendly, anti-allergy tested. Spring hinge make these sunglasses comfortable to wear, even for large face. 90 DAY MONEY BACK GUARANTEE -- All IALUKU customers enjoy 90 Day Money Back Guarantee. Customers can return and get refunded in case the purchasing is not satisfactory for any reason. You have no risk to try and we will provide you the best service! 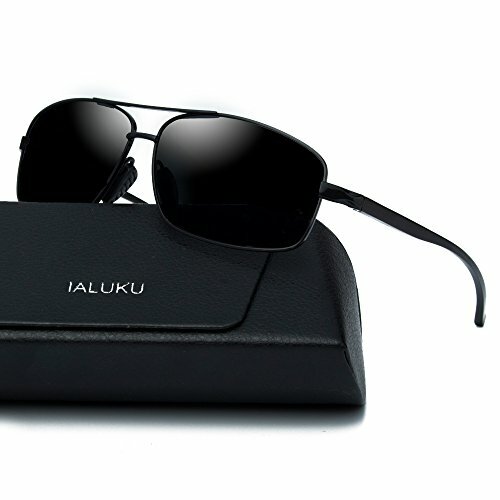 IALUKU Rectangular Polarized Retro Aviator sunglasses for men are a great addition for anyone who wears eye protection.